If you're looking for Cape Cod Style House plans, I wrote this page to help you decide whether or not this house plan style is right for you. So to set the scene we’ll go over some of the common features of the Cape Cod Style, then we’ll go on to discuss factors to consider if you’re thinking about going for this style. The Cape Cod style house plans available today are a popular and affordable house style. They retain many of the original features which bring to mind the simplicity and efficiency that was part of the great adventure of the Pilgrim Fathers. 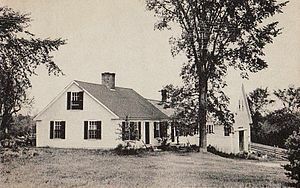 Cape Cods are the first types of New England Colonials to be built so they are both very similar in style. Simple rectangular shape with a steep roof and gables to the side perpendicular to the front door. The door in the middle creating a center hall arrangement in the interior. The warming fireplace and chimney in the center of the home. Windows arranged symmetrically, with shutters, which are for decoration only on today’s houses. One story or two stories with the second story in the roof space making 11/2 stories. Dormers have been added to the original style to increase the light coming in. The roof ridge (the long bit of the roof) runs parallel to the long side with the front door which faces the road. Extra rooms and garages have been added to the original style to accommodate today's lifestyles. Is a Cape Cod style house plan suitable for your home? Flexibility – If you’re going to be true to the Cape Cod Style then the chimney has to be in the middle of the home and the windows a symmetrical design with a steep pitched roof. The chimney in the middle is the design element can make this style a little bit inflexible but the upside to the central chimney is that it’s a very efficient way of having a fireplace in several rooms. Lot Shape – Cape Cod Style homes are designed so that the ‘long’ side of the rectangle runs parallel to the road. There’s also windows in the gable ends so there needs to be room on all fours sides of the house for light to get into the home. Sloping Site – The style could be adapted much more easily if the slope is perpendicular to the main roof line – that’s generally from the front to the back of the house than if the slope went from across the front of the house. Scalability – Traditional Cape Cod style house plans generally range from 1,200 to 1,800sqft. If you want something bigger the best idea is probably to move towards a Colonial style home which essentially adds another story. Another option is to add another building, with a breezeway to connect the two. Another way to increase the square footage would be to move away from a symmetrical arrangement and have another set of windows on one side of the front door. This would add more space in the attic, but not as much as the main floor. Expansion Potential – The pitched roof (both on top of the main house and/or on top of the garage if you build one) is the ideal place to expand at a later date if you don’t have the budget to everything straight away. Cost of Construction - The simple rectangular shape of cape cod style homes mean that they are one of the best styles in terms of cost of construction. The Pilgrim Fathers started it all in 1620, bringing their building styles and building know-how over from England. Faced with the cold winters of New England they had to build quickly and they needed to be warm. This led them to build simple flat-walled (quick to build) houses using timber (quickly available nearby) and they needed a fire to keep them warm (and for Santa who I think was just getting started around the time of the Pilgrim Fathers). Shutters were the perfect solution for windy, rainy nights and the snow had no chance of staying on those steep roofs for long. This is the Hartford Residence in Bridgton, Maine. You can just about see the symmetrical plan with the chimney at the center, flanked by shuttered windows.